PEX Plumbing is the future of the plumbing industry. It is longer-lasting, less expensive and easier to install than copper. It is also energy efficient and environmentally friendly. PEX Plumbing involves PEX tubing, PEX fittings, PEX manifolds or Plumbing Manifolds, and the PEX Tools that accompany these parts. These PEX Plumbing resources will help you to learn more about the benefits of using PEX and how to make the best choices when designing your system. There are several reasons why PEX is quickly replacing copper in many plumbing applications throughout the United States. These include lower cost of material, the level of difficulty of making connections which also leads to lower labor costs, the likelihood of pipes bursting, product availability and color coating. The table below shows the comparison of each item, copper vs. PEX. AquaPEX, made by Wirsbo (Uponor) is the highest quality tubing available on the market today. AquaPEX is PEX-a tubing and therefore is more homogeneous (with the chemical bonds evenly spread out) making it both stronger and more flexible. These characteristics come from the Engel production method for PEX-a tubing. Because of the tubing's strength it is able to hold up better to freezing conditions, and it can be unkinked using a heat gun. It is also the only brand of PEX plumbing tubing that can be used with the Wirsbo Expander System. All other brands of PEX tubing can be looked at as a group. When purchasing another brand of tubing, be sure the product is being made by a reputable manufacturer, has at least a 20 year warranty, meets ASTM standards, and meets the desired pressure ratings. If you follow these guidelines you will come up with a group of products that includes Rifeng, Viega PEX, and Zurn PEX. When comparing these products, price or brand preference will often be the deciding factor. PEX stands for Poly Ethylene Cross (X)-Linked. It is the cross-linking process that makes PEX strong, safe and reliable, and it is how this process is done that determines what grade, or category, the PEX belongs to. Depending on the grade of PEX that you choose, the flexibility, strength, and uniform nature of the material will be affected. The letters tell you how the PEX was created and the quality of the PEX, with A being the highest grade, followed by B, and finally C.
PEX-a is made using the Engel (or peroxide) method to crosslink the molecules of polyethylene. With this method, the crosslinking is done at a high temperature above the melting point of the crystals. This "hot crosslinking" produces an incredibly uniform material with no weak spots. The Engel method produces the strongest, most flexible PEX tubing possible, allowing for an installation with fewer joints and fittings than any other type of PEX. PEX-a also features a strong thermal memory and freeze protection, which means that once the tubing is expanded or contracted, it will naturally go back to its original shape. Since the process takes more time and more sophisticated equipment, PEX-a tends to be a bit more expensive than PEX-b or PEX-c. AquaPEX is the only PEX-a material available for plumbing applications. Examples of PEX-a for radiant heat include MrPEX and hePEX. PEX-b is made using the Silane (or moisture cure) method. This method performs the crosslinking with a chemical agent where the process is accelerated using heat and moisture. This chemical crosslinking is susceptible to some areas where the bonds are weaker than others and a slightly stiffer final product than PEX-a. Examples of PEX-b include Rifeng, and Viega PEX. PEX-c is made using the Electron beam (or radiation) method. This method takes the polyethylene and passes it under an electron beam multiple times in order to get to the desired level of crosslinking. This is the most energy-efficient method of creating PEX, but often results in a more brittle, less consistent product than PEX-a or PEX-b. Electron beam is also the least expensive method and therefore creates the least expensive tubing. When deciding which grade of PEX is right for your application, you should think about the layout of your tubing. If many tight bends need to be made, it is likely worth the extra few dollars for PEX-a so that you can avoid breaks in the tubing to insert elbows. 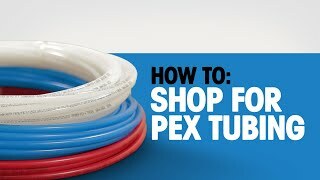 PEX-a is also probably worth the extra money if the tubing will be exposed to very cold temperatures or to make the installation process easier. Pex Plumbing system design can be done in a similar fashion to traditional Plumbing Systems. However, because of its flexibility PEX saves time and money as compared to installing traditional copper plumbing systems. The options for running PEX in a plumbing system are listed below, they are not listed in any preference order. In this system central manifolds are used to distribute water to all of the fixtures in a given residence or building. Manifolds may either be valved or valveless and are generally made of copper or engineered plastic. If they are valveless, shutoff valves must be used at each fixture. These manifolds contain between 3 and 12 ports (generally 1/2") to connect PEX Tubing to. One of the central manifolds will receive cold water, and one manifold will receive the hot water supply. Each fixture will then have one dedicated cold PEX Tubing line and one dedicated hot PEX Tubing line which begin at the manifolds. Using this method minimizes the overall number of connections required. This method also takes advantage of the flexibility of PEX Tubing. One main benefit of this setup is the reduced time required for hot water to reach the fixture. 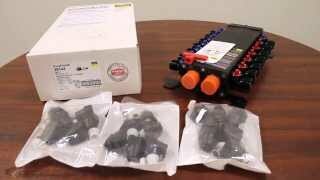 In this PEX Plumbing installation method close-end remote manifolds are placed near groups of fixtures, i.e. a bathroom. Two manifolds, one hot and one cold are placed close to the group of fixtures. PEX Tubing is then run from the manifold to each fixture. Valveless manifolds are typically used, however valved manifolds may be used as well. Structured PEX Plumbing systems make use of the recirculation of hot water. Manifolds in this system will be located near groups of fixtures. For the hot water lines, open ended manifolds are used. By doing this, the hot water return line is created as an extension of the hot water supply line. This system's main benefit is a reduction in the usage of water and energy due to the on demand recirculation. This method is similar to home run installation, but it uses several flow-through manifolds instead of central manifolds. These open ended manifolds may be either valved or valveless. This method uses less PEX tubing than the home run method and may provide hot water faster than other installation methods. This method is also referred to as "teeing off". It is commonly used in rigid plumbing systems such as copper and CPVC. A PEX fitting such as a tee or elbow is used each time the tubing needs to be split or change direction. 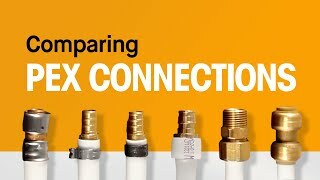 This method requires more connections than other methods of PEX Plumbing. This method does not take full advantage of the flexibility of PEX Tubing. For all of these installations the system should be inspected and pressure tested prior to being filled with water. The system should be pressure tested to between 40 and 60 psi.